Black spider lollies from Jackie Boucher & Ohdeedoh. Halloween spiderweb cupcakes from Little Birdie Secrets. Itsy Bitsy Spiderwebs cupcakes from Country Living (photo by Con Poulos). Pumpkin chocolate spiderweb tart from Martha Stewart. Along Came a Spider cake from Country Living (photo by Con Poulos). Spider devilled eggs by Joanie Pimentel at Sunset Magazine (photo by Leigh Beisch). Spider ice cubes (with blood red punch!) from Noble Pig. Chocolate spiderweb cake-in-a-jar from I Am Baker. Not pictured: spun sugar spider nests with choux eggs, creamy tomato soup with web topping, hairy leg spider cookies, licorice spiders, chocolate cake spiders with Pocky legs, & orange-eyed spider cookies. Hanging cocoon man and larva balls, $29.00-$49.00 at Grandin Road. This was the inspiration for this party concept, because I find it so creepy! Here’s a D.I.Y. version, too. Web-covered window with trapped bats from Good Housekeeping (photo by Gemma Comas). Spooky lamp by The Yellow Cape Cod/Sarah Macklem Interiors. Quick spun webs from hot glue, from Martha Stewart. Spiderweb door photo by Sister72. Coffee filter cobwebs from Mega Spooky. Webbed chandelier from Better Homes & Gardens. Spider house from Apartment Therapy. Webbed typewriter from Poetic Home. Cobwebbed candles from Martha Stewart. Spiderweb balloon tutorial from Crafty Crafty. Giant spider web from Target (in-store only). Not pictured: spider egg sac tutorial. Monstrous 6″ long Halloween spider, $148 at Walmart. D.I.Y. Halloween spider with PVC legs from Halloween Forum. Cheesecloth chandeliers and wall spiders at the Curious Sofa (click through for all the images, it’s amazing!). Spooky spider-covered door & web sign from Martha Stewart. Window webs & giant spiders from Better Homes & Gardens. D.I.Y. glitter spiders from Sweet Something Design. Spider vinyl clings (click through for templates) at Pretty Handy Girl. Haunted tablescape from Good Housekeeping. Spider pumpkin from Brooklyn Limestone. 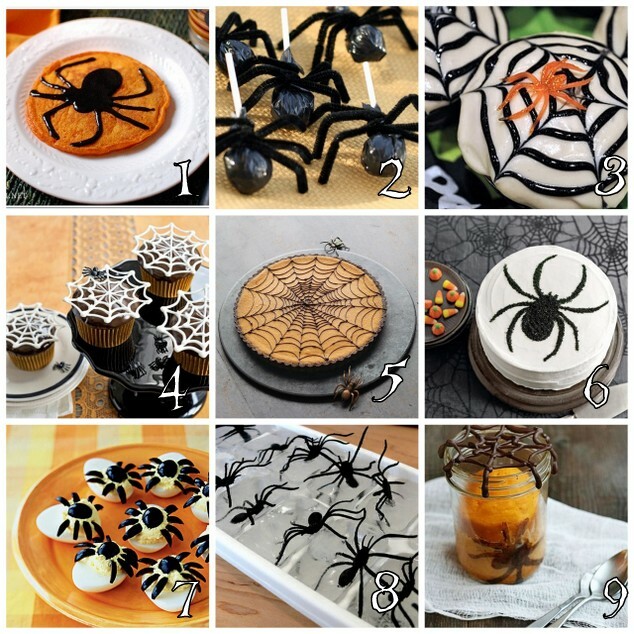 Martha Stewart has spider stencils. Realistic D.I.Y. spiders by moGuyver on Instructables. Spider vase filler (sold out) at Pottery Barn. I love the way this arrangement conveys motion. Balloon spiders from Martha Stewart. D.I.Y. small spiders from Born to Haunt. Spider plates designed by Lisa Storms for Fiskars. Hope you enjoyed this post! Up next: Halloween Week 2011: Dexter Party Concept. Thanks for adding my knock-off version of Martha’s expensive web and webbed people! Not at all–it is a cool tutorial. Thanks for dropping by!